UNV’s V-Force initiative empowers volunteers and brings communities together, creating a space for communication between volunteers and UN entities, and enhancing collaboration towards achieving the Sustainable Development Goals (SDGs). While Sri Lanka has a long tradition of volunteerism (known as shramadana), plans to establish a formal platform for volunteerism began in 2011 when UNV initiated the Volunteer Task Force (V-Force). The V-Force brings together individuals keen to volunteer their skills and time to share ideas, mobilize resources and implement development initiatives. It unites people from many different backgrounds and serves to bridge the gap between the general population and the United Nations. Through V-Force, UNV localizes the SDGs and mobilizes volunteers to enhance development and build peace. Sri Lanka has a population of 20 million. In 2014, 8.6 million Sri Lankans volunteered at least once a year; that’s around 40 per cent of the country’s able population, many of whom are in rural areas. Some of the most recent statistics place 22 per cent of Sri Lankans as living below the poverty line. For these people, volunteering offers a chance to expand their skill set and increase their opportunities. For others, volunteering has provided them with a stronger voice and confidence. Heshoban Thavakumaran, who first volunteered for the International Volunteer Day in 2012, describes how V-Force enabled him to contribute. On visiting post-conflict areas such as Kilinochchi, he describes a project “aimed at reaching survivors of war, aiding them to overcome their traumatic experiences and providing psychosocial support in grieving lost members of the community.” He continues, “It was a project that reached beyond ethnic barriers and I was able to join hands with the community towards reconciliation and long lasting peace". Since 2011, volunteers have participated in projects in diverse areas. 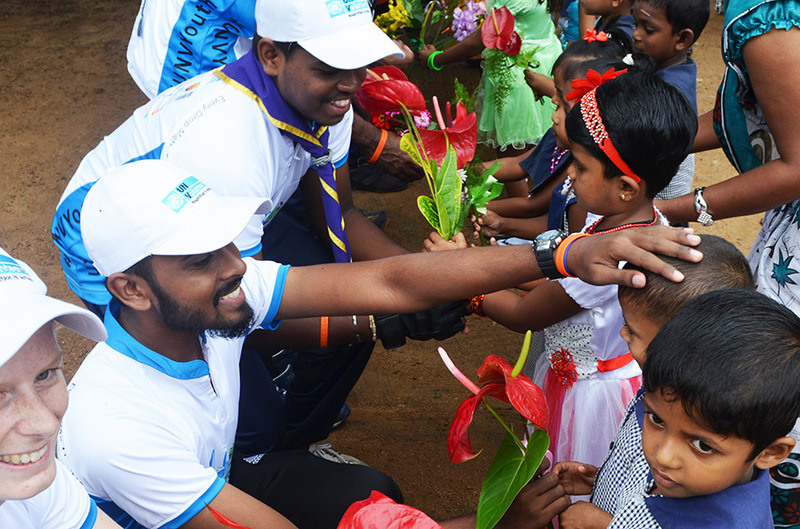 The World Conference on Youth in 2014 saw over 2,000 volunteers mobilized for this event, hosted by the Government of Sri Lanka with support from UNV, the Resident Coordinator’s Office, and the United Nations Development Programme (UNDP). V-Force volunteers also participated in the 2014 National kite festival where over 300 volunteers contributed to the event organized by the Ministry of National Languages and Social Integration in collaboration with UNV. More than 20,000 people participated in the festival across seven locations. In 2016, the Public Representation Committee for the Constitutional Reform (PRC) was formed in cooperation with the Prime Minister to gather and compile public proposals for reforming the constitution. 60 V-Force volunteers used their knowledge as students of Law and Social Sciences to review submissions, making important contributions to the PRC by compiling recommendations to the Parliament of Sri Lanka. V-Force now has over 6,600 registered members. Each year, over 1,000 V-Force volunteers are mobilized to support UN entities, including the UNDP, the World Food Programme, and the World Health Organization. Over 50 per cent of registered volunteers state that they have an opportunity to learn more about the UN and the activities it undertakes in Sri Lanka. Some 90 per cent feel that V-Force allows them to further develop their knowledge and skills. UNV is a key resource for enabling community level engagement and the creation of opportunities for youth volunteering. Already, other countries – including Bangladesh and Bolivia – have begun to launch similar programmes. Volunteerism is an important, cross-cutting issue, and one within which V-Force plays a critical role. This case study was drafted with the kind support of UN Online Volunteer Robert W. Bailey.